The Los Angeles LGBT Center traces its roots to 1969 when the founders of the organization first began providing client services. Today the Center’s more than 450 employees and 3,000 volunteers provide services for more LGBT people than any other organization in the world through programs that span four broad categories: Health, Social Services & Housing, Culture & Education, and Leadership & Advocacy. The Los Angeles LGBT Center’s Clinical Research Program conducts research projects and clinical trials that are focused on improving the health and well-being of LGBT communities locally and globally and that contribute to scientific knowledge on the prevention, intervention and treatment of HIV and sexually transmitted infections (STIs). 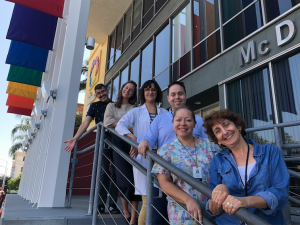 Learn more about the staff at the Los Angeles LGBT Center by clicking here. The UCLA Vine Street Clinic is an outpatient site of the UCLA Center for Behavioral and Addiction Medicine (CBAM). The mission of the CBAM is to advance the prevention and treatment of chronic illnesses, especially in communities with healthcare disparities. We envision a society where every person is able to access the highest quality health services to reduce substance use, HIV risk, and other behaviors which impair health. The UCLA Vine Street Clinic is located in a transitional neighborhood designated as a medically underserved area. The facility includes exam and counseling rooms for patient care, a lab for collection and storage of biological samples, and group meeting space. It has provided prevention programs and clinical trial opportunities to more than 4,000 patients since opening in 2005. Since that time, it has served as a site for clinical trials, behavioral research, and direct services. What we learn from the clinic informs every aspect of the Center’s work. The success of UCLA Vine Street Clinic programs have led to local, national and international collaborations focusing on the treatment of addiction, HIV prevention, and the intersection of the two. 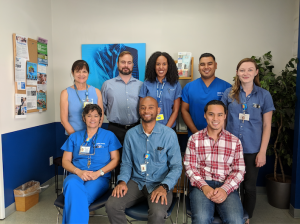 Learn more about the staff at the UCLA Vine Street Clinic by clicking here.